Besides automobiles, Mister Jalopy also deals in old O'Keefe and Merritt gas stoves. This beautiful example is being stripped to it's most basic components. 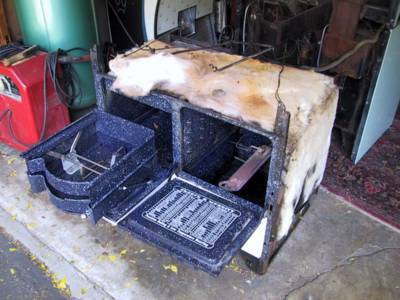 If this stove were to be refurbished and sold, and if the lovely mint green stove behind it was completed and in place, there would be a possibility of moving the chicken coop roof Mercedes into the garage. This lovely stove will be available for purchase in about 10 days.